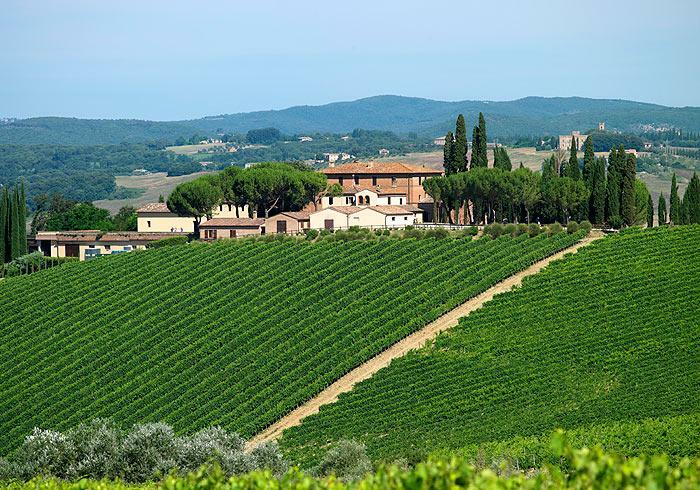 Though the worldwide reputation of Brunello has encouraged some conservatism among Montalcino estates, Altesino has always been a leader, unafraid of innovation. The estate pioneered the technique of aging its IGT wines in small French oak barrels, limiting the time spent in oak to enhance each wine's personality. The resulting wines were a groundbreaking improvement over those produced by traditional methods. No longer overwhelmed by wood, they were able to display the unique characteristics of the fruit, with softened tannins and perfect balance. Not content to rest on its laurels, Altesino became the first Montalcino estate to introduce the concept of cru wines, made with a special selection of grapes from a single vineyard. Its Montosoli Brunello, named after the prestigious vineyard, was the first of these wines and is still considered among the regions finest. Altesino also pioneered the concept of Brunello futures (wine purchased before its release) with its 1985 vintage. This commitment to innovation led to many modern wines in the estates portfolio, including Alte d'Altesi, Palazzo Altesi and Rosso di Altesino. Elegance, finesse, and a fruitier, richer style are the trademarks of Altesino's wines and have earned the estate a position among the very top producers of Brunello. This achievement is even more impressive considering Brunello is perhaps the most recognized Italian appellation. James Suckling 94 A wealth of ripe fruit with spice, orange peel and cherry. Full body, fine tannins and a bright and vivid finish. Drink in 2021." James Suckling 97"Fantastic aromas of blueberries, plums, bark and wet earth follow through to a full body, velvety and polished tannins and a wonderful finish. Refined and persistent on the finish. Drink in 2019 and onwards." James Suckling 95"Wonderful decadent aromas of musk, orange peel and plum follow through to a full body, with soft tannins and a long and rich finish. Salty and savory. Layers of gorgeous fruit. Drink or hold. " James Suckling 97"Beautiful aromas of dark fruits and minerals. Full-bodied, succulent and chewy. It's tight and stony. Lots of black olives and wet earth under the fruit. Bright and linear wine with beautiful layers. Better in 2018." James Suckling 95"Wonderful decadent aromas of musk, orange peel and plum follow through to a full body, with soft tannins and a long and rich finish. Salty and savory. Layers of gorgeous fruit. Drink or hold. Wine Spectator 89" Round and fruity, with good cut defining the cherry, strawberry, bitter herb and tobacco flavors. Shows fine balance and harmony, finishing with elegance. Drink now through 2020. 3,300 cases made. " James Suckling 90" Very pretty Rosso with spice and berry character and hints of dried cherries. Full to medium body, with silky tannins and a long fruity, citrus finish. Outstanding Rosso. Drink now. " ~ JamesSuckling.com "
Wine Spectator 96Collectible"Very beautiful aromas of flowers, ripe fruit and crushed blackberries. Full-bodied yet refined. Layers of tannins. Balanced. Montosoli is a great Brunello vineyard. Best after 2008. 1,500 cases made. (JS)"